This sort of story makes me a bit sad. And it seems to occur all too frequently. I don’t want to die alone, in an apartment, and not be discovered by benefit of wafting aroma months after the fact. I’m quite sure that no-one wants this as the final act of their life. So, how to live a life of significance? A life where people actually knock on your door to see if you’re ok? (Or text, or email). I’m thinking my philosophy of trying to make a difference to every person I meet is a decent start point. And hopefully, it’s a positive difference. It’s important to me that my kids have some sort of role model thing going on. Looking ahead, I’ve already planned my funeral extravaganza (in my head, and it’s awesome, and there are dancers and comedians everywhere) so frankly my expiration will be entertaining on some level. Here’s to the future of being positive and impactful! (And not desperately alone and insiginificant). I have mentioned this in a previous post but it is an interesting story, worth revisiting and digging into. Recap: I’m adopted. My birth Mother, U.K.-based, whom I’ve met two times in the last 6 years having tracked her down 8 years ago, sent me an email last week with ‘by the way I’ll be in Auckland on Friday”. That kind of spun my world a bit. A little digging and I’ve learned that she’s kept things quite quiet. Not only to me, but also to her close family in Somerset. And here’s the rub: my birth Father (who lives in Tauranga) is her first port of call. And he has kept things quiet. My half-brother is as off-balance as I am. We like a plan. Mum is 76. 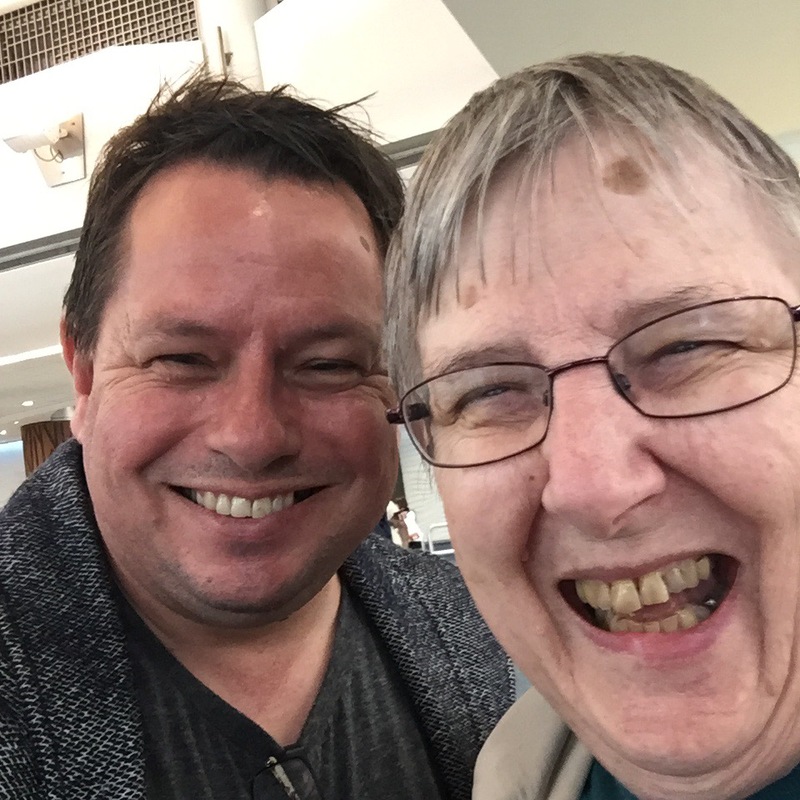 She’s just done a 36hr global transition and I got to meet her at the airport. We had about 30mins available to catch up before she was whisked away by the shuttle driver. She did her OE from England in 1967. Got pregnant with me, gave me up for adoption, and in 1970 returned home and didn’t tell a soul of her experience and my existence. Different times huh? She’s seen my dad briefly in the last 46 years. He got across to the UK in 1990 or thereabouts. But little contact since. This is an amazing reconnection. Super-cute, yes. It’s so great that she’s here as she will be able to meet my kids – her grandchildren – and all the other significant people in Simon-land that she’s only heard about. It’s like the Universe is conspiring to move pieces in my world to a start position of sorts. It is exciting and concerning in equal measure. Jeepers. I just got a surprise! I’m adopted (many know this) and my birthmother lives in the UK. I’ve met her and my British side of the family a couple of times but haven’t been able to be back there in the last few years. My kids have never met her nor have my wonderful adopted parents. I received an email overnight which was “blah blah blah, by the way I’ll be in New Zealand next Thursday”. NEXT THURSDAY!! I’m gobsmacked and excited in equal measure!